US Blanks 609R (68.1 litres) Rusty Preisendorfer design with our stock 4 mm unidirectional ply stringer. 6 ’10 1/4″ long, 23″ wide and 3 9/16″ thick. Designer Comments: The big brother to the 6’5” R to cover models in the upper size range. 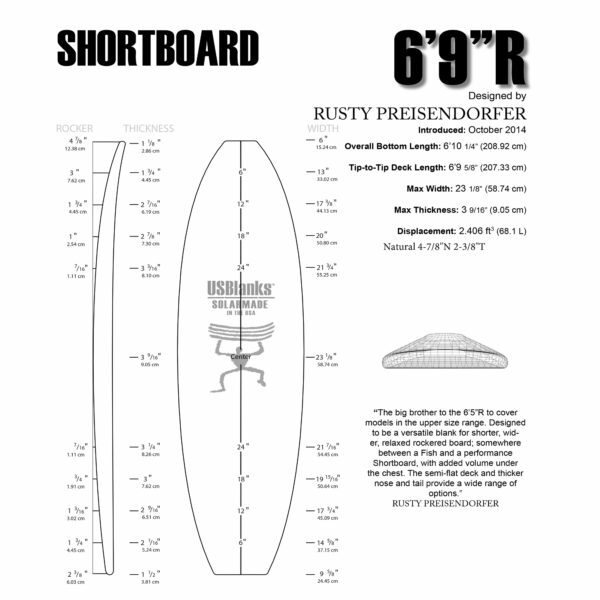 Designed to be a versatile blank for shorter, wider, relaxed rockered boards; somewhere between a fish and a performance short board. Plus volume under the chest. The semi-flat deck and thicker nose and tail provide a wide range of options. US Blanks 6’09″R 68.1 litres. Rusty Preisendorfer design with a 4 mm ply stringer. 6 ’10 1/4″ long, 23″ wide and 3 9/16″ thick. Designer Comments: The big brother to the 6’5” R to cover models in the upper size range. 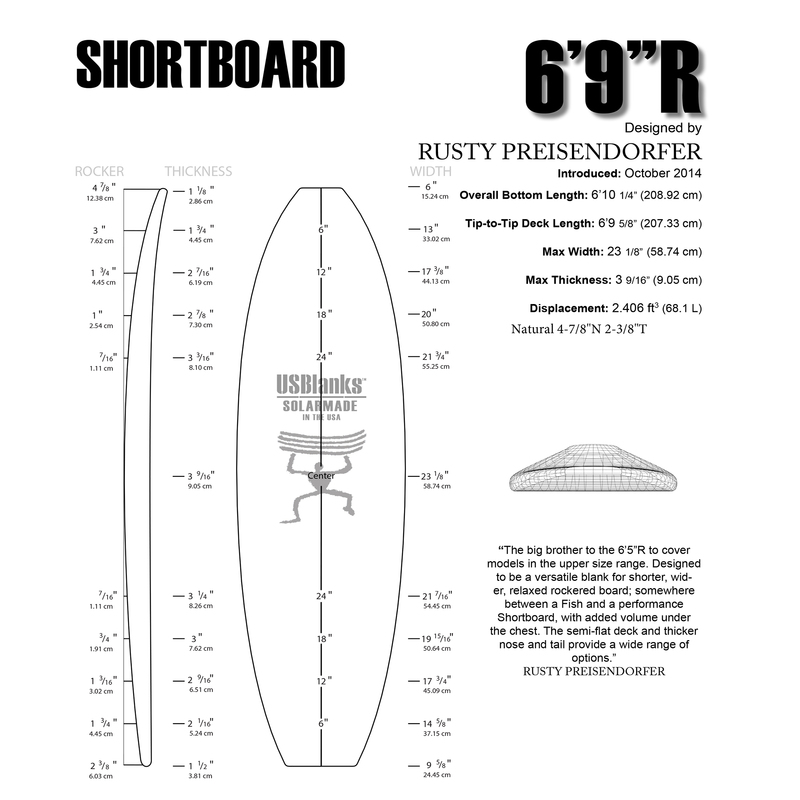 Designed to be a versatile blank for shorter, wider, relaxed rockered boards; somewhere between a fish and a performance short board. Plus volume under the chest. The semi-flat deck and thicker nose and tail provide a wide range of options. 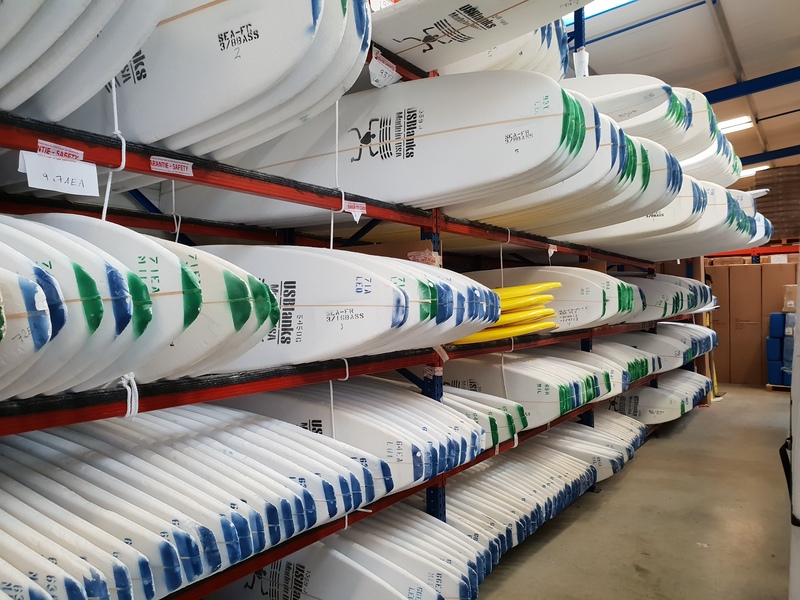 US Blanks: The world’s best selling surfboard foam – without doubt the strongest, most accurate, most user friendly foam on the market. 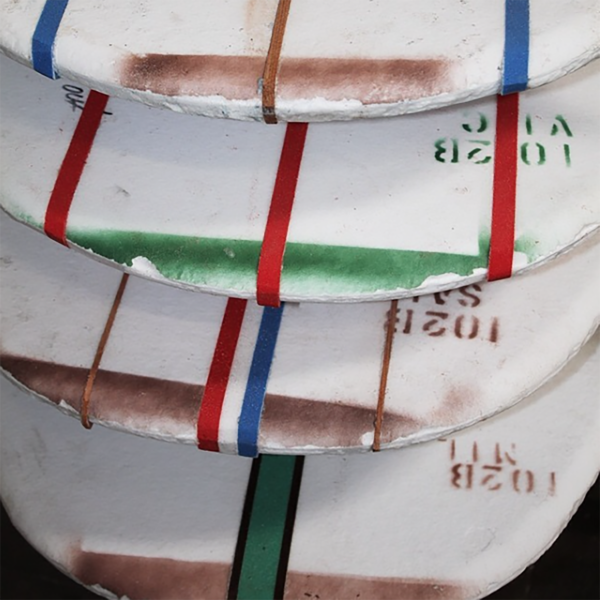 Surfboards made with US Blanks have the best feel according to all research. The stringers are straight, clean and easy to plane. The foam cleans up so well. The plugs are from the best shapers, bar none. Plus you get custom rockers, coloured foam, coloured glues, a huge range to choice from, and total respect! We’ve seen foam companies come and go – this is the foam from which all our production is produced, and we recommend (and guarantee) every blank we sell.